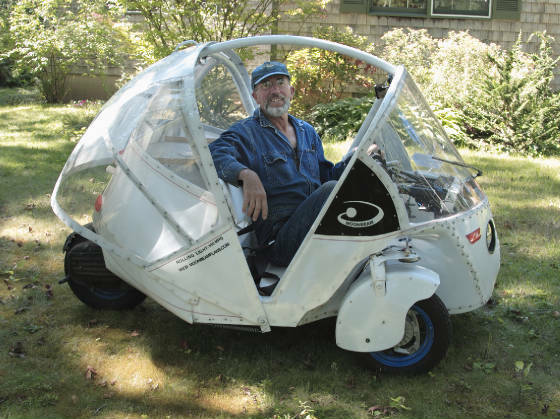 Jory Squibb, Camden, Maine, built the Moonbeam, which cruises at 40 mph and gets 100 mpg. The "Microcar" was made from a 1987 Honda Elite 150 motorscooter in excellent condition for most of the running gear, controls and instruments. Additional parts were from a 1984 Elite 125, the frame and body were fabricated by Jory. It cost $2339 in materials and 1000 hours of labor. The best cruising speed is 35-40 mph with occasional times of 45. The car goes 53 MPH on the level, but Jory finds that speed worrisome. Fuel economy has been tested many times. On economy runs at a steady 40 MPH, it gets 105 to 106 MPG. Around town, it's usually 80-85 MPG. Jury decided that he wanted the following characteristics: 100 miles per gallon, a 150 cc four-stroke engine with water cooling for heating the cab in the winter, good pep in the 0-40 mph range and good emissions; an occasional small second-passenger capacity, but usually one passenger and 6 grocery bags; no gear shifting with hand controls only; variable speed drive for simple driving; an enclosed vehicle with a heater for all-weather operation and a 3-wheel configuration to avoid the many 4-wheel vehicle regulations. He wanted to steer with handlebars using all the electrical controls, brakes, throttle, as well as the speedometer cluster from the Honda. This is a major simplification as it uses so much of the original engineering of the Honda. The details of the construction are on his website. After constructing the sub-frame and re-installed the motor unit in the sub-frame, he built the suspension system and re-installed the handlebar steering system from the Honda. After that he simply needed to reconnect the wiring harness, reattach the speedometer to the handlebars, then attach the horn, ignition switch, fuse box, radiator and put a battery box near the engine, and press the starter button. He then had a drivable chassis which he got licensed and then drove around and tweaked a few parts so it steered better. He had a few constraints for the body: It had to be strong enough to roll over at 45 MPH with the occupants safe. It should be nice looking, aerodynamic, with lots of sun and light, zero maintenance, no leaks, easy entry, and be able to be left outside in all weathers. He mocked-up the body with conduit, perhaps the fun-est part of the whole project. He stuck with the 1/2" conduit until the body was complete with all the constraints met. He decided to use 1/8" Lexan for the clear parts and 1/8" high-density polyethylene for the opaque parts. Designing and building the canopy hatch/doors was the most difficult part which is described in detail on the website. The canopy can be snap locked in three positions, open,closed and midway. The heater, above the driver's left knee, works all the time, so in summer, the canopy is usually partially open at least. The handlebar switches control starter, horn, lights, wipers, turn signals and the right hand brake controls the two equalized front brakes, while the left is the parking brake and rear brake. Two additional switches control the headlight on-off, and the direction of the heater flow, either down to the driver's feet or up to the windshield. The Moonbeam is 79" long, 52" wide, and 56" high. It weighs 386 pounds unloaded. The front tires have a 40" spacing and a 56" wheelbase. The tires are 3.50-10 and 4.00-10 on the rear. Thanks for the tip from gizmag at Moonbeam the 100mpg DIY car costing US$2500 (and 1000 hours). I know someone who could use one of these immediately. Pity that production is rather unlikely. They are booking 200cc 4stroke for about US$2800. Looks Pakistani. I doubt it could be imported to the US for anything close to that price, or that it would be street-legal if it was. How does it get 100 mpg, when the original Honda Elite gets around 50-60 mpg?